iHT5 Tuning lathe machine with FANUC control system, Included Standard Equipment and Standard Control System Functions. Integrally molded low center of gravity casting bed, 30 ° saddle through optimized design, It has a large shock damping and a smaller amount of deformation, the main axle box, turret. Providing high-rigidity structure basis. 30 ° slant bed design to facilitate the operator upper and lower parts, but also to ensure. Smooth chip evacuation. IHT series Tuning machine with FANUC control system, Included Standard Equipment and Standard Control System Functions. Integrally molded low center of gravity casting bed, 30/45 ° saddle through optimized design, It has a large shock damping and a smaller amount of deformation, the main axle box, turret. Providing high-rigidity structure basis. 30/45 ° slant bed design to facilitate the operator upper and lower parts, but also to ensure. Smooth chip evacuation. Compact design with HT300 high tension Meehanite cast-iron machine bed. Perfect accessibility and optimal working depth. The ideal machine for training, with minimal space requirement and uitable working depth to the spindle. Increased productivity with up to 12 driven tools ( optional). Headstock with heat sink design is integrated casting. Rigid tapping function as standard to realize high-speed precise tapping without floating tapping collets. Easy to program better tapping ccuracy, offers maximum tapping productivty. With high performance V-belt driving spindle, make maintenance easier,also reduce the impact of the spindle accuracy from the heat on spindle notor conducting. By adjusting pulley reduction ratio, to synchronize the indle& the motor maximum rpm, thereby reducing the minimum rpm of the maximum power output increasing torque, which maximize spindle motor's potential achieve maximum turning capability. IHT series have optional FANUC 0I TF control package & SIEMENS 828D control package. 8.4' display, 10.4 display, extra interfaces etc. ready for customers. German descent i H T series has the best parts, like a knife tower SAUTER, NSK bearings, etc. to ensure high-precision parts, as well as appropriate should the price to have a high cost performance. High stability and perfect machining results thanks to the integrally molded massive HT300 cast iron bed. 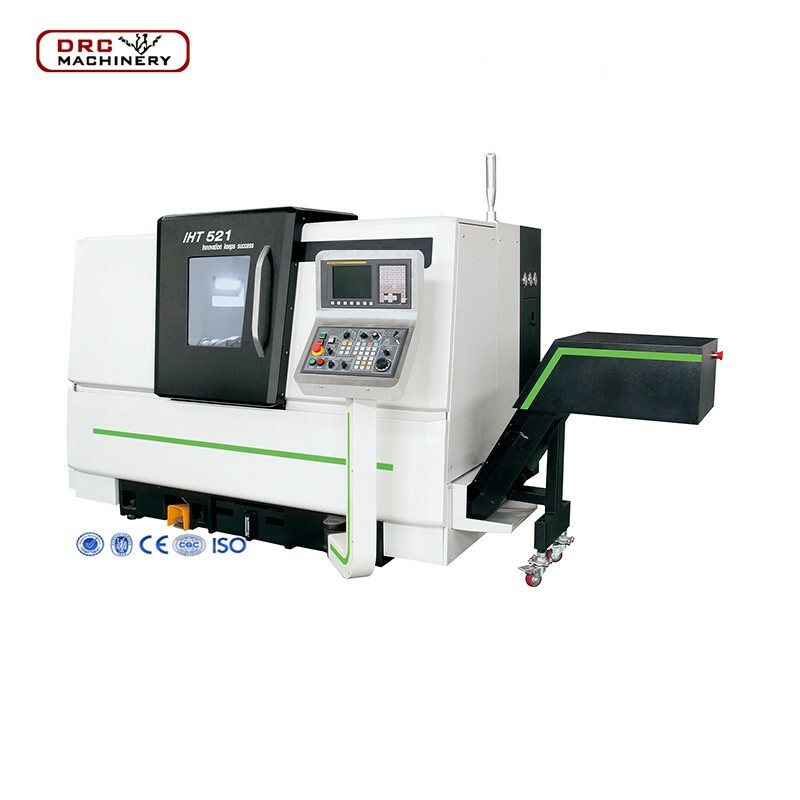 The bigger spindle bearings and the appropriate wide spacing between the guideway ensure that iHT series machines by high accuracy and rigidity. Slot disk, vDl disk, BMT disk, electric turret, servo turret, servo-driven turret all can choose by the customer. Hydraulic controlled tailstock, servo tailstock all can choose. Inner housing made by the stainless steel which can avoid to rust.